FAQS ON SWINE FLU ~ Welcome to Maharashtra !!! Swine flu is a respiratory disease affecting pigs that is caused by type A influenza virus. Swine influenza viruses may circulate among swine throughout the year, but most outbreaks occur during the late fall and winter months similar to influenza outbreaks in humans. It causes high levels of illness but low death rates in pigs. Swine flu viruses that cause disease in pigs very rarely affect humans. However, sporadic human infections with swine flu have occurred. Most commonly, these cases occur in persons with direct exposure to pigs but there have also been documented cases of human-to-human spread of swine flu. Swine flu spreads to humans mainly through contact with infected pigs, which shed the virus in their saliva, nasal secretions and faeces. Limited human-to-human transmission can also occur in the same way as seasonal flu occurs in people. The symptoms of swine flu in people are expected to be similar to the symptoms of regular human seasonal influenza. An early symptom is high fever, and this is followed by cough, sore throat, runny nose, and sometimes breathlessness a few days later. To diagnose swine flu, a respiratory specimen would generally need to be collected within the first 4 to 5 days of illness (when an infected person is most likely to be shedding the virus). However, some persons, especially children may shed the virus for 10 days or longer. 7. 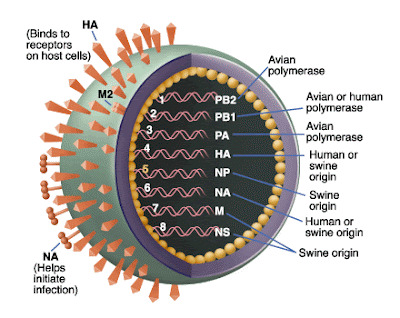 What medications are available to treat swine flu infection in humans? There are three different antiviral drugs that are licensed for use in Singapore for the treatment of influenza: amantadine, oseltamivir and zanamivir. Another antiviral drug, rimantadine, is also licensed for use in the United States for the treatment of influenza. While most swine flu viruses have been susceptible to all four drugs, the most recent swine flu viruses isolated from humans are resistant to amantadine and rimantadine. At this time, the US CDC recommends the use of oseltamivir (Tamiflu®) or zanamivir (Relenza®) for the treatment and/or prevention of infection with swine flu viruses. -Avoid crowded areas and maintain good ventilation. -Observe good personal and environmental hygiene. Wash hands thoroughly with soap and water frequently and when they are contaminated by respiratory secretions e.g. after sneezing. -Maintain good body resistance through a balanced diet, regular exercise, having adequate rest, reducing stress and not smoking. 9. What should I do if I fall ill overseas? 10. Does influenza vaccination help in preventing Swine Flu? Vaccines are available to be given to pigs to prevent swine influenza. 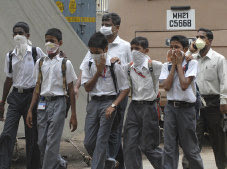 There is no vaccine to protect humans from swine flu so far(August 2009). The seasonal influenza vaccine is unlikely to protect against H1N1 swine flu viruses. Note: The information given here is for the precaution & awareness regarding H1N1. Please seek medical help/advice, in case of any confusion with the nearby doctor/hospital.